A regular Cabinet meeting was held today, chaired by Prime Minister Karen Karapetyan. Before proceeding to the agenda, the Prime Minister gave a number of instructions. The Premier’s first recommendation concerned the measures aimed at encouraging and developing entrepreneurship. 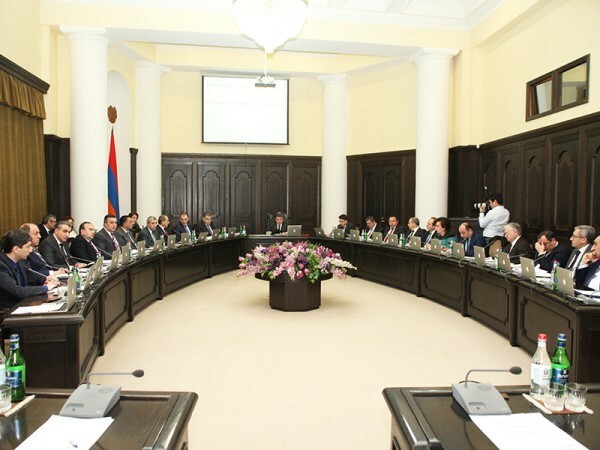 According to the Head of Government, the provision of favorable conditions aimed at improving the business environment by public authorities and the launch of such measures as may ensure unimpeded development of the business environment is of great significance for the development of Armenia’s economy. “In this regard, we must initiate legislative changes to the Criminal Code of the Republic of Armenia aimed at criminalizing the offense of deliberate evasion of taxes, duties or other mandatory payments,” Karen Karapetyan said. Taking into account the need to take consistent steps toward promoting and encouraging entrepreneurship, the Head of Government suggested that law enforcement agencies while exercising their discretionary powers within the framework of the fight against crime should avoid interfering with business entities’ activities and, therefore, take such enforcement action as may undermine or otherwise worsen business operations solely in extreme cases. Total costs or expenses, including material production costs, depreciation, repair costs, salaries, administrative and other costs, taxes and mandatory contributions, other financial expenses. “Provide for the presentation of 2017 corporate business plans within a three-week period. Submit to the State Property Management Department by the government concrete proposals on the assessment of the performance of their companies, which will allow us to fully evaluate the results of operations of the companies,” the Premier said. The Head of State Property Management Department by the Government was given a month’s time to provide information on the availability of business plans and their compliance with the specified format. The State Property Management Department was also told to review the indicators, assessment of companies by the heads of executive agencies and the governor and present a proposal to the Government to ensure the application of the system and its results based on the application of the rules on companies’ liability for directors. “All projects shall meet strict standards. The asset in trust should provide a clear idea of our expectations. Managers need to be selected based on the programs they offer – in open and understandable way,” Karen Karapetyan pointed out. The Prime Minister’s next instruction targeted the system of education. “We cannot have high-quality education without qualified teachers and modern standards-compliant academic curricula. Unfortunately, we are today practicing merely formal training of teachers, as in most cases substantial training is just replaced by the physical presence of trainees. There is an urgent problem with the quality and content of school textbooks, and these questions are constantly being raised both by the parents and by the teachers,” the Prime Minister emphasized and instructed the Minister of Education and Science to develop a program within a month to improve the operations of the National Institute of Education by implementing a comprehensive review of its functions and structure. For this reason, the Premier instructed the Minister of Justice to examine certain functions reserved to the penitentiary system, in particular the provision of food to the prisoners, including the possibility of ordering it to private entities. The Ministry was told to develop new mechanisms to minimize corruption risks in the process of sending parcels. The Minister of Justice was also instructed to use all the necessary resources to achieve proportionate distribution of inmates in penitentiary institutions, including through the full commissioning of Armavir PI. The Minister was given a month’s time to complete the above. The Government approved the second stage of the Energy Efficiency Action Plan for 2017-2018. Energy saving and efficiency is considered to be a priority as a means of reducing the negative impact on the country’s energy security, economic competitiveness and the environment as a whole. The measures specified in the program will facilitate the further development of energy efficiency policies. The first stage has led to 8.6% overall savings. The latter is expected to reach 17.9 percent this year. In a bid to expand and intensify trade and economic cooperation between Armenia and China, the meeting made a decision to set up a post of Armenia’s Trade Attaché in the People’s Republic of China. The amendments are supposed to bring into conformity with the international standards the procedures set for calculation and payment of royalties from sales of final products of processed metallic minerals concentrates or moldings, as well as to rehabilitate the application of the basic method of calculating royalties. The bill provides that the tax authority shall apply an 80% limit in case of indirect assessment of the base of royalties. It was also stipulated that prior to the adoption of this law in the case of indirect method of recalculation of royalties and the exemption from fines and penalties as recalculated through the indirect method, the head of the tax authority will be reserved the right to set a schedule for royalties, taking into account the possible timing of the entry into force of the law with the application of the regulation from January 1, 2017.